I... am... a... label reader. There, I've said it. If you have grocery shopped with me, you have sighed over my need to read the label before purchasing. If it is a product well-known to me, I do not need to read the label because I already know what is in it and it has been deemed 'approved'. But... if you have travelled with me to another country, let's just say the United States for example, and were to stay in a vacation rental and need ALL.OF.THE.GROCERIES... you might be wishing you had never stepped foot into that grocery store with me. Let's just say I'm thorough. So, what is it I look for when reading the nutrition label on a product? What passes the test? 1. Serving Size - The first thing you need to look for, is the amount of food in a serving size as defined by the Nutrition Facts Table (NFT). 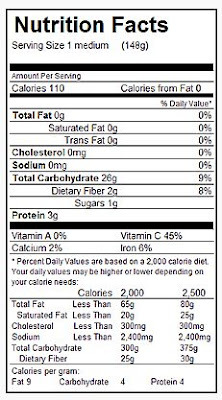 This number may be found just under the heading "Nutrition Facts" (see below). In this case, the serving size is 1 medium potato or approximately 148 grams. Note: It is okay to eat more or less of this serving size of course, but you will need to adjust all of the other nutritional amounts. 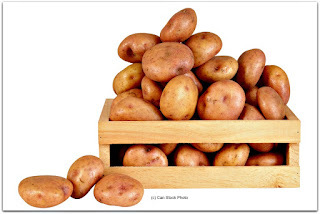 For example, 2 medium-sized potatoes would have twice the calories, protein and carbohydrates. 2. Calories. 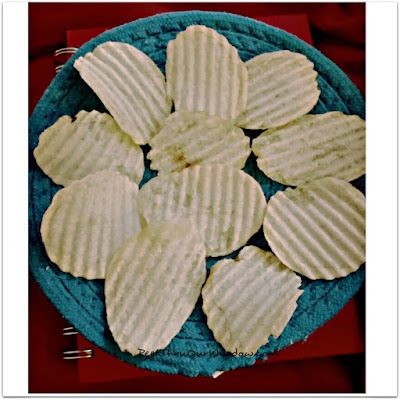 The calories present in a serving are comprised of fats, carbohydrates and protein. Calories are an in/out thing, meaning that to maintain a healthy body, you must consume only what you burn throughout your daily activity. The average caloric intake for a male (18+) is approximately 2200 - 2800 calories, while for a female (18+) is approximately 1800 - 2200 calories. These 11 potato chips are ONE serving. Sigh. 3. The Percentage of Daily Value (% DV). The %DV is located on the right hand side of the Nutritional Food label and is used to determine if the serving size has a little or a lot of a specific nutrient. Consumers are able to choose foods that have more of the nutrients that they want like fibre and calcium, and less of those they don't want, like saturated and trans fats or sodium. 4. The ACTUAL Ingredients. Lastly, what are the actual product ingredients? Is the list full of words you do not know how to pronounce? Foods with the least amount of ingredients is always your best choice, but if you find yourself stumped on the %DV math, the ingredients list is your next go-to. WIN A $100 GROCERY GIFT CARD! This giveaway is open to all Canadian residents (excluding Quebec) over the age of 18. The winner has 48 hours to respond by email, or another winner will be drawn. The winner will have a choice of grocery gift card, dependent upon on the area of Canada they reside. Ends Thursday, March 24th at 12:01am MST.